Subway Sandwiches & Salads for more than 25 years continue to win fresh food battle in Medford. It has 17 stores in beneficial locations and it has turned out to be the biggest series of quick food service providers with assistance of Southern Oregon team. They are known to make custom sandwiches all the time with amazing selection of meat choices, fresh baked breads and wide range of vegetables. 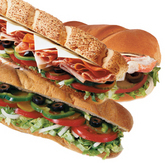 Subway Sandwiches & Salads is owned and managed locally. They are known to offer varieties of healthier alternatives and get access to detailed nutritional information for customers. They have switched to practices and products improving water conservation, quality of water and food, improving energy efficiency etc. There are currently 0 consumer reviews about Subway Sandwiches & Salads available. Share your review. Please take a note that you are about to post a public review about Subway Sandwiches & Salads corporate office on CorporateOffice.com. This review will be public, so please do not post any of your personal information on this website. If you would like to contact the corporate offices of Subway Sandwiches & Salads, please use their contact information such as their phone number, website, and address listed above to contact them. However, sometimes staff from Subway Sandwiches & Salads headquarters do read the reviews on this website.